I took Dylan to the zoo today while his Mommy worked and his Daddy took care of Addie. My friend Donna came along. Always nice to have an extra set of eyes, ears and hands when you're looking after a three year old! We saw lions, tigers, elephants and monkeys. I think the little meerkat that was splayed out on his back looking up at us was the cutest thing ever! Donna really loved the gorillas and bears. And, for Dylan, it was all about the alligators and hippo. We had a great time, but unfortunately, I forgot my camera. 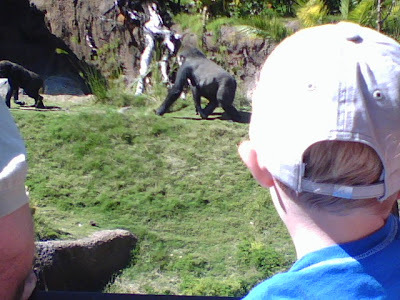 Here is one shot from my cell phone of Dillie looking at the gorillas.